It was not that long ago that the industry was amazed when the first movie– or maybe it was a TV episode?– had been shot on a Canon 5D Mark II, a digital SLR made for still photographers but that could shoot up to 12 minute 1080P movie clips . Was it a feature movie, first, or a TV show, shot with the Canon 5D? Certainly when an episode of the television series House was shot entirely on the Canon 5D Mark II instead of the usual 35mm film the cinema world took notice. That was then. This is now. That was the golden era (can you say that about events just five years ago?) of digital. Fast forward five years. The Sundance Film Festival earlier this year featured the “breakout hit” Tangerine, that was shot on an iPhone. Fast forward again to this week, and the keynote speaker at the SXSW Film Festival, filmmaker Mark Duplass, just told the audience that “there is no reason not to be making films with your friends on the weekends”, and told filmmakers not to overlook the potential of “the $3 short film” shot on, what else, an iPhone. 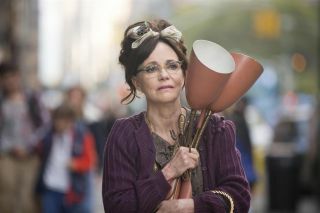 "Hello, My Name Is Doris" that had its world premier at SXSW Film 2015, was shot on the ARRI ALEXA, and features Sally Field’s character Doris–looking as beleaguered as the movie industry itself– stumbling into a local, younger hipster scene in pursuit of romance. Is cinema– the production and theatrical experience based on high production values and high exhibition values– headed for a demise as swift and scary as what befell the recorded music industry? The good news is, it’s not– for now. But you can’t understand what’s going in theatrical and the larger world of Hollywood without understanding the dynamic of A-tier film festivals today and how they have become not so much a platform for seeking theatrical distribution but something new– a place where the movie industry meets the television industry, through back doors and sides doors that all lead to a new world of content delivery. Duplass, who opened SXSW film with his Keynote, is a successful filmmaker and has graduated from microbudgets to now making high production value movies. But Duplass had one big message to filmmakers at SXSW: “The Cavalry is Not Coming”. “If you read the trades, and you’re involved in conversations, it’s mostly bad news” said Duplass, pointing to “the death of the middle class of independent films”. “Where are those cool $5 million dollar movies that break out of Sundance?” asked Duplass. And Duplass asked what VOD means for the death of the theatrical experience. Is the glut of material (low budget indie movies) keeping people from going to see things in the theaters? “The one thing that keeps coming up over and over in my career, is a simple phrase, the Cavalry is not coming,” said Duplass, channeling not Truffaut or Cronenberg or Scorsese but motivational speaker Tony Robbins. So, who’s cueing the bugles?